The figure portrayed by Karol Radziszewski (b. 1980) is August Agbola O’Brown (1895–1976), a jazz musician born in today’s Nigeria, whose territories were colonised by the British at the time. He arrived in Warsaw in 1922, after staying in London and the Free City of Danzig where he had played drums in the local clubs. O’Brown settled down in Warsaw and started a family; his son Ryszard was born in 1928, followed one year later by another son Aleksander. O’Brown formed part of the history of Warsaw not only as a talented musician, but, above all, as a participant of the Warsaw Uprising of 1944, which was an armed insurrection against the German army that occupied Warsaw during World War II, a fact that Radziszewski highlights in his paintings. 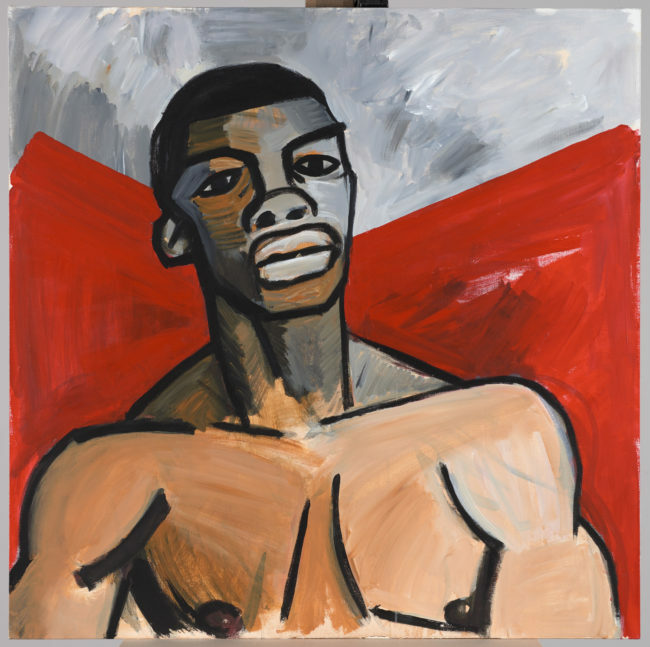 The work belongs to the series titled Ali in which the artist refers to the Cubist aesthetics of Pablo Picasso’s paintings in order to emphasise the fascination with African culture in European art and popular culture at the beginning of the 20th century. Thus, the artist evokes the historical and cultural context in which O’Brown appeared in the capital of Poland. Radziszewski presented him in an insurgent uniform with a weapon against the backdrop of red and dirty ashen white, making an ambiguous reference to the Polish national colours, and thereby to the problematic of patriotic struggles. “Ali” took part in the Defensive War in 1939, and in 1944 he became a soldier of the Warsaw Uprising, fighting in the “Iwo” battalion in the southern part of the city centre in the area of the streets: Wspólna, Wilcza and Marszałkowska. He survived the Uprising and left Warsaw in unknown circumstances. He was never imprisoned in a POW camp and returned to the capital city shortly after the war. O’Brown worked for a certain period at the Culture and Art Department of the Municipal Office in Warsaw; he also found employment as a musician at different venues. In 1958, as a British citizen, he emigrated to Great Britain. O’Brown’s story is situated on the margin of the 1944 Warsaw Uprising’s mainstream narrative. He does not belong to the circle of most prominent heroes whose names inhabit the collective historical consciousness. Radziszewski discovered his biography while exploring the sources for his work on a series of insurgent portraits, which were to form a mural for the Warsaw Rising Museum. He reclaimed Ali’s history, referring to the canon of representations of heroes and, at the same time, to the style of paintings by the 20th century most outstanding artists of the 20th century, who visited Warsaw in 1948. The image of “Ali” in the Room of Portraits can be understood not only as an attempt to bring back to memory yet another participant of the struggle for liberation. O’Brown is also one of “Varsovians by choice”, a newcomer who developed a strong identification with the city and was prepared to risk his life in its defence.